Freshly steamed broccoli read for fritters. I’m constantly on the hunt for healthy recipes that use food as medicine. 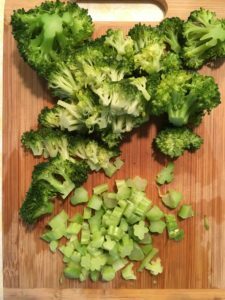 I’ve tried almost every reasonable anti-inflammatory diet under the sun and found that works best for me is something between paleo and vegan. While those two diets may seem opposite, if you do them right, they can be quite similar. Both diets can, and should, emphasize hearty servings of plant-based nutrition. Under paleo rules, processed food is a no-go, but a lot of vegan foods are highly processed. No one forces a vegan to buy processed foods, but at least for me, the temptation to do so was difficult to avoid. Now, I take the paleo idea of fresh, whole foods and apply it to veganism— for example, eating a plate of vegetables and fruits instead of a plate of soy cheese and chips. When I was strictly vegan, I fell into the processed food trap way too often and ended up eating “cheese” that had enough mysterious ingredients to be a science experiment. When I went paleo, and then strict paleo under Whole30, I gave up all the junk and focused on truly healthy food. I didn’t like the amount of meat required under paleo, so I eventually merged the two concepts and now feel better than I have in years. A wonderful woman I met through Instagram posted about some awesome meals she made last week, and I followed the trail to figure out where the recipes originated. That trail led me to Every Last Bite, a food blog run by a woman who manages autoimmune disease through healthy— and delicious— meals. My eyes went straight to her recipe for broccoli fritters, and after a five-mile run through the rain, I decided to give them a try. My dad brought us three giant heads of broccoli earlier this week, and I’ve been wondering what to do with all of them. The broccoli fritters recipe seemed like the perfect way to use up a good bit of what my dad brought, and it was. There’s only half a head left, which is a pretty big deal considering how much he gave us. The only thing the recipe called for that I wasn’t sure we had on hand was nutritional yeast, but after a quick look through the cabinets, I found I still had plenty in a tightly sealed glass jar. The other ingredient that some people may not have on hand— almond flour— is a staple in our house, and I had a fresh bag ready to use for the fritters. I don’t have a food processor (well, I do somewhere, but it has yet to show up since our recent move), so I used the small carafe on my Ninja blender. While the broccoli steamed, I blended all the other ingredients into a surprisingly good-smelling batter. When the broccoli was done, I let it cool a little, then sliced it according to the recipe directions. After the olive oil got hot in the pan, I got ready to drop my first spoonfuls into the oil and, hopefully, make something delicious for lunch. I was a little skeptical, mostly because I’m not always the best recipe-follower, but the batter smelled good enough to make me optimistic. Clearly I’m not a food photographer, but I promise these broccoli fritters were awesome! After a few minutes and even more good smells, the first two fritters were ready. I barely waited for them to cool enough before chomping a big bite out of one. It’d been an hour since my run and I’d only had a few grapes, so I was super hungry. I couldn’t believe how good the fritters tasted. They were somewhat like broccoli cheese soup (the cheese flavor comes from the nutritional yeast) mixed with something that tasted fried. Food heaven. 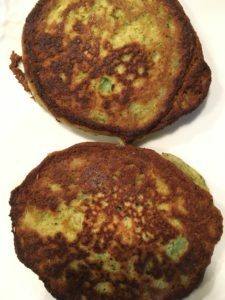 I made four large fritters instead of several small ones, and the first two were gone quickly. My wife isn’t usually a fan of broccoli, but I suspected she’d love the fritters, so I reluctantly practiced restraint and waited for her to come home and eat the remaining two. She loved them too, and couldn’t believe how good they were. She even said, “the broccoli is really good in here,” which is a sentence I never thought I’d hear. I’m excited about trying several more recipes from Every Last Bite. I haven’t decided what to make next, but I wanted to pass on this excellent resource to anyone else who might be looking to change up their food routine. Cheers, friends! Click here to go the Every Last Bite for tons of health-minded recipes!